Love this quick links - makes keeping drive chain clean a real pleasure. No issues with chain stick or shifting despite these links. Can undo the link without need for tool, however I do use the tool as it makes it super simple. I bought these extra just so I would have a spare with me on the bike just in case. Have not had any issues re-using, even though packaging suggests no reuseable. Keep these in stock all the time. They say they are a one-off use, but I have refitted many times without problems or clicking. Quick and easy and reliable what more is there to say. For use with the KMC gold chain, bought as a spare just in case! These links eliminate the hassle of pinning your chain. Great deal on a great product. Merlin had the re-usable 11 speed version so I stocked up on this hard to locate item. Used these before and found them to be reliable and easy to see on the chain. Fine for shimano 11 speed chain. I normally use the Sram links but Merlin wont send them to Canada so this is my second choice, I think they work as well and I have not noticed any more wear on these than I do with the Srams. I guess its all good that way. Makes it a snap to clean your chain properly. 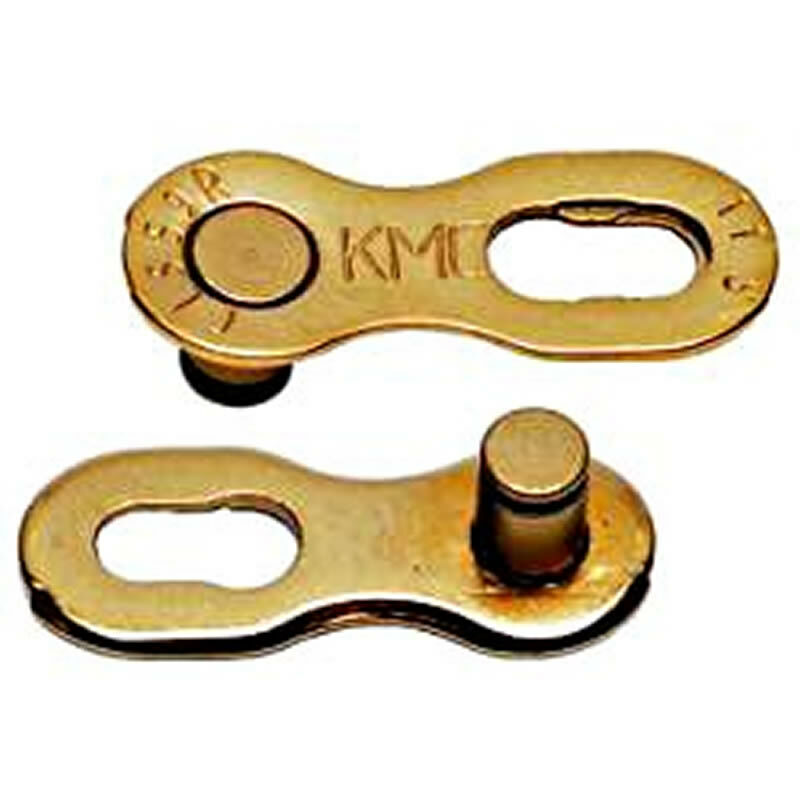 The same as the link provided with the KMC 11-Speed Chain. They state they are not reusable, but with the correct removal tool, or modified pliers in my case, I have never had any trouble reusing them. I bought this pack for emergency chain repairs out on the trail. This is a much better solution for the Campagnolo 11 speed chain than using the Campy tool and pin. The easiest way to join chains especially in emergencies. Always carry a spare set in the seat pack. Quick and easy to use. Far easier than the Shimano pin. You get two. Always good to have a spare. Don't forget to order the right colour. If you don't just pretend to you club mate it was deliberate bling. Works as advertised. Single use only instead of re-usable like the 10 speed links. Hopefully I won't need to use them very often. To join the Shimano 5800 chains. Work very well and contrary to the packaging can be used more than once. Usual excellent service from Merlin. Got this quick link for the Ultegra chain and it works just great. Purchased these KMC 11x chain links for a new 11 speed set up having used 10 speed ones before. A lot harder to get them to lock up and I think could be trouble to release with out the special tool, but it does state one use only on the packet, shame as it is easier to clean chain off the bike. But as it's on the other half`s bike she will just have to struggle cleaning it. Used on a Shimano 6800 as more convenient than shimano's pin. Works seamlessly and the gold helps when applying lube.